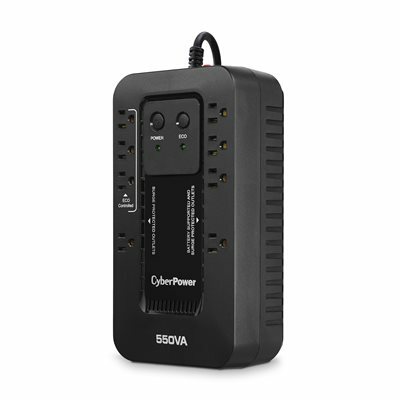 The CyberPower Ecologic Series EC550G uninterruptible power supply (UPS) safeguards PCs and other electronics (monitors, cable DSL/ modems, speakers, and VoIP routers) from blackouts, brownouts, surges, spikes, sags, and other power abnormalities. Its composite integrated circuitry offers advanced lightning protection. Patented GreenPower UPS advanced circuitry reduces UPS energy costs.The CyberPower EC550G has three surge protected ECO outlets. When ECO mode is on and the battery backup detects that your computer is off (or in Sleep mode), computer peripherals connected to the ECO outlets will be turned off (USB connection required). This provides additional reductions in power usage and greater energy savings.The EC550G unit has a capacity of 550VA/330Watts, eight (8) NEMA 5-15R receptacles, including, 3 ECO mode outlets, and two (2) widely-spaced outlets to accommodate transformer-based plugs. Its compact design allows for horizontal or vertical placement, or it can be mounted on a wall. 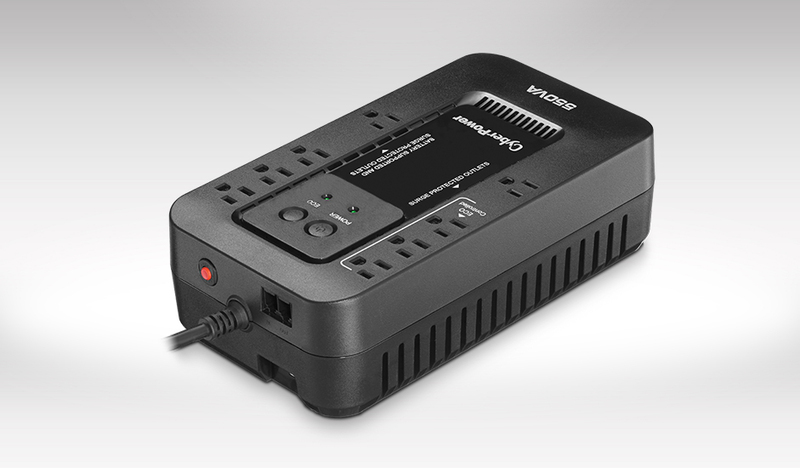 This UPS has a 12-volt maintenance-free sealed lead acid battery that is replaceable by a qualified service technician. Protection for phone/network (RJ11) is also included. EMI/RFI filters increase the immunity of the load to disturbances and surges.A HID compliant USB port provides connectivity to the EC550G. PowerPanel Personal Edition UPS Management software is included to monitor the vitals of the UPS and will safely shutdown the system in case of a power outage. Even brief power outages can result in data loss or hardware damage. This UPS provides enough emergency backup to keep your devices running during momentary outages, and enough runtime power to close files and properly shut down your electronics during extended outages. It also safeguards connected equipment from storm-related power surges, activity on the power grid, or high-powered equipment turning on and off. This product comes with a with a $100,000 connected equipment guarantee. See user manual for details. Use PowerPanel® Personal software to manage runtime, track power events and more.